JKowners.com : Jeep Wrangler JK Forum > Vendors > CARiD.com > April Sale on Rugged Ridge Products at CARiD! April Sale on Rugged Ridge Products at CARiD! Rugged Ridge is the market leader for Jeep replacement and restoration parts and one of the most beloved brands among Jeep owners all over the world. Their product line includes over 3,000 Jeep products of premium quality, custom designed to match your valuable ride. From body protection to interior accessories, chrome trim, winches, performance upgrades, and electrical parts, Rugged Ridge products are sure to stand the test of time and help you drive safely both on and off the road! 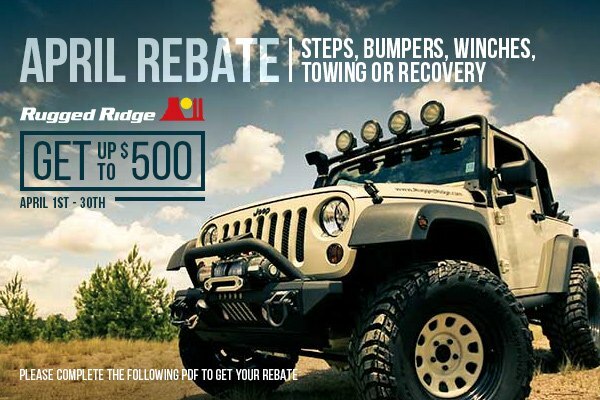 Purchase Rugged Ridge products and GET up to $500 Cash Back. Get the most out of your Jeep with Rugged Ridge. Act now, this limited time offer ends on April 30, 2019. Please complete the following PDF to get your money back.